How To Play Dream League Soccer With Friends Online..!! Currently, in this article, we are providing you the complete guide for how to play dream league soccer online. If you are a fan of soccer and want to play the best game like FIFA then Dream League Soccer is the best game for you. Most of us know about the actual FIFA game, but Dream League is not one to look like the FIFA game. What is Dream League Soccer? You can sign players and choose the team formation you want. Once you are ready with your team, you can make your team to play through the six different leagues and compete to reach the number one position. It depends on you and the game is actually pretty neat that you have control over your own team. The developers made the visuals and tried to make it as realistic as possible. As DLS is online game you will be played with teams all over the world. The more you win the top position you will reach. Licensed FIFA players to choose from. Constant update of leader boards. Sync game progress with other devices through iCloud. Objectives throughout the season for you to beat. Replay certain moments and save them so you can see them later. 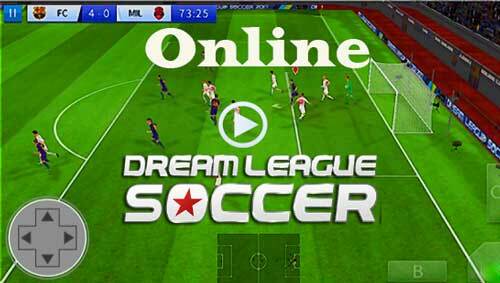 Wanna Play Dream League Soccer Online? If you are interested in playing dream league soccer game for free there are few ways to play the game. You can download Dream League Soccer game for your smartphone from Apple iTunes store or from Google play store. This game is compatible with both PCs and Macs. You can download Dream League Soccer game either from apple play store or from Google play store. After visiting the store all you need to do is install the game. If you are downloading it on your Apple device, make sure that you are connected to Wi-Fi. The game size is 100mb so to download it requires an internet connection. Once the game is downloaded you can play it anywhere. The download of the game is really simple and it is free to download. If you want to play Dream League Soccer on PC then you need to install android emulators like Blue stacks, Andy and other emulators. Download the emulator to your PC and install dream league soccer game from there. So now you have downloaded the game and now all you need to do is start playing. You can select a team captain from five or six players, so choose wisely. After clicking continue for two times and reading some tips and rules, you will be navigated to the home menu. This is the place where you will make all team decisions and find your next matches. On starting of the Dream league Soccer game it gives you 1,000 coins. On the home menu of the game you will see the options “play now, multiplayer, transfers, my club and team management.” If you have any doubts then you can find them from help. Check your profile and take a look to know how many coins you have. This is the place where you can sign and can sell players. After each game different players will be available and you can choose any player among them. You can go through the list of players and can check each player stats. If you want the specified player, then click on the player and you will be asked if you want to sign the specific player. You can also sell players by clicking on “sell player.” It’s really simple to help build and create the team you think will be most successful. Dream FC Stadium: You can design and create the stadium in your desired way. Statistics: You can check overall stats, academy division, global challenge cup and elite cup. Customize Team: You can edit your team, players, kit and logos. Player Development: In this section you can get the players whose skills want to develop and get better. Objectives: You can see the tasks which you suppose to complete throughout the game. Training: Allows you to train your team and the functions. You can play dream league soccer online in multiplayer mode. The multiplayer gaming mode allows you to play online against other teams. If you win a match you will get three coins, for a draw match you will get one point. So by playing online you can increase your scores on leader boards for the online community to see. You can also complete seasons by playing online. So, playing in multiplayer mode is really like playing in a tournament and you can also get to play other built up teams by online users. That’s all about how to play dream league soccer online. If you have any questions regarding this post, please do comment below, we will reach you as soon as. Thank you for watching our site. 1 What is Dream League Soccer? 2 Wanna Play Dream League Soccer Online?